Rufin Anthony, the bishop of Islamabad, has denounced the culpable silence of Muslim leaders who have failed to forcefully condemn what is being called “the worst religiously motivated hate crime in Pakistan’s history”—the recent murder of a Christian couple in Pakistan. On November 4, Shahzad Masih and his pregnant wife Shama Bibia, the parents of four children, were stoned and then burned alive at a brick kiln in Pakistan. The two victims were killed by an angry mob of hundreds of people stirred up by a local religious leader for allegedly burning pages of the Qur’an. Many have begun asking how a blasphemy law that justifies killing in the name of religion can exist in today’s world. Tauran said that the first victims of this outrage are the Muslims themselves, “because these crimes give Islam a terrible, very negative image. They should be the first to denounce them forcefully,” he said. Despite the horror of these crimes, Muslim officials continue to look for scapegoats and place blame elsewhere. 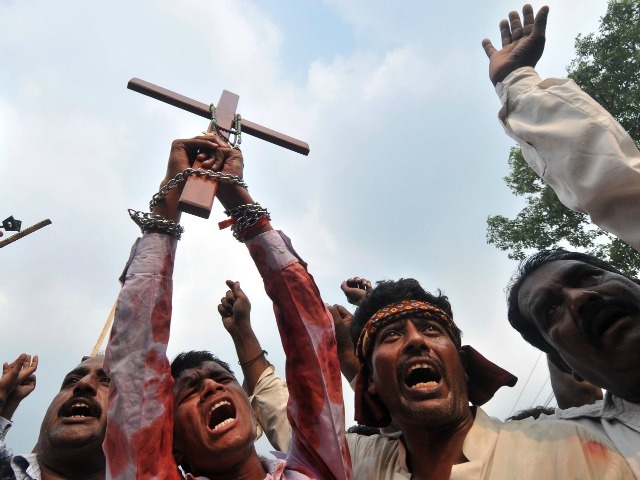 Since its inception, the blasphemy law has been applied brutally against religious minorities. In 2012, a teenaged Christian girl with Down Syndrome, Rimsha Masih, was arrested under the blasphemy laws, and released on bail. She and her family had to be relocated because of threats against them. In 2011, two politicians – Salmaan Taseer, a Muslim, and Shahbaz Bhatti, a Catholic – were assassinated for opposing the blasphemy laws. Yet Ashrafi has refused to question the blasphemy law that has encouraged these brutalities, preferring instead to blame the local police. So far the police have stopped some forty people for questioning but there have been no official charges. A recent Pew poll showed that 75 percent of Pakistanis believe: “Blasphemy laws are necessary to protect Islam in our country.” Pakistan’s blasphemy laws entail that insulting the prophet is punishable by death.